Anacreon (/əˈnækriən/; Greek: Ἀνακρέων ὁ Τήϊος; c. 582 – c. 485 BC) was a Greek lyric poet, notable for his drinking songs and hymns. Later Greeks included him in the canonical list of nine lyric poets. 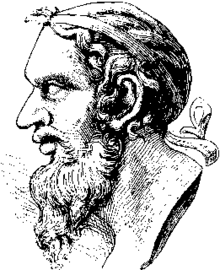 Anacreon wrote all of his poetry in the ancient Ionic dialect. Like all early lyric poetry, it was composed to be sung or recited to the accompaniment of music, usually the lyre. Anacreon's poetry touched on universal themes of love, infatuation, disappointment, revelry, parties, festivals and the observations of everyday people and life. 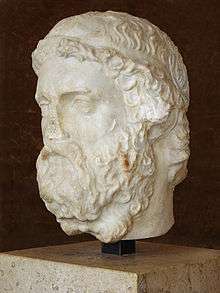 Anacreon was born at Teos, an Ionian city on the coast of Asia Minor. The name and identity of his father is a matter of dispute, with different authorities naming four possibilities: Scythianus, Eumelus, Parthenius, or Aristocritus. John Addison (1735) writes that Stobaeus tells following legend. Having received a treasure of five gold talents from Polycrates, Anacreon couldn't sleep for two nights in a row. He then returned it to his patron, saying: "However considerable the sum might be, it's not an equal price for the trouble of keeping it". A collection of poems by numerous, anonymous imitators was long believed to be the works of Anacreon himself. Known as the Anacreontea, it was preserved in a 10th-century manuscript which also included the Palatine Anthology. The poems were published in 1554 with a Latin translation by Henry Estienne, known as Stephanus, but little is known about the origins of the manuscript. Salmasius reports seeing the Anacreontea at the library in Heidelberg in 1607. In 1623, it was given to Pope Gregory XV after the sacking of Heidelberg. It was later taken from the Vatican City by Napoleon in 1797, who had it rebound as two separate volumes. One of those volumes was returned to Heidelberg but the other remained in the Bibliothèque Nationale in Paris. Typical of most efforts at translation, this 19th-century one by Walter George Headlam takes the subject matter of Anacreon's verses and works them into a rhyming style typical of the English poetry written in Headlam's day. The subject of the poem still remains: Anacreon complaining that a young woman, whom he compares to a Thracian filly, doesn't recognize his amatory skills. Anacreon is quoted by the character of Agent Pendergast in Douglas J. Preston & Lincoln Child's Relic (novel) (1995). Anacreon is the subject of two separate operas by the French composer Jean-Philippe Rameau, both called Anacréon (the first premiered in 1754, the second in 1757), as well as the opera-ballet Anacréon ou l'amour fugitif (1803) by Luigi Cherubini. "To Anacreon in Heaven" is the opening line (and often mistaken for the title) of "The Anacreontic Song", the official song, reportedly written by John Stafford Smith, of the London amateur musical club the Anacreontic Society. The US national anthem, "The Star Spangled Banner", is set to the tune of "The Anacreontic Song". ↑ "Anacreon". Encyclopædia Britannica Online. This article incorporates text from a publication now in the public domain: Chisholm, Hugh, ed. (1911). "Anacreon". Encyclopædia Britannica (11th ed.). Cambridge University Press.